What an appropriate feast day (The Birth of St. John the Baptist) to reflect on persecution of those who stand up for the family and are persecuted for it! They walk in the footsteps of St. John. I received the email below from a friend and supporter of the Red Rose Rescues. If you aren't familiar with these events, they are totally peaceful. Rescuers go into the waiting room of an abortion mill and quietly give the mothers a red rose and a card telling them help is available. They offer concern and counseling. They do not block doors or do anything aggressive; they simply offer alternatives to the women and ask them to do what mothers do -- protect their children. Two of the rescuers from the West Bloomfield, MI event disobeyed an order to stay away from any abortion mills and have no contact with other pro-lifers involved. Wow! Talk about judicial overreach! The judge is clearly pro-abortion! He called them "dangerous" and "anarchists." Wow! Antifa is treated better than that! But going to jail can be a blessing. Here's the email report from my friend. Letter from Will today! I don’t think he’s ever been happier! He is evangelizing fallen away Catholics with addictions and singing songs with them, lots of Johnny Cash with other secular songs and hymns that he knows. He said he was happily surprised when the courtroom broke out in applause before they led him away! And that he heard via a phone call of Monica’s great witness too! He receives Christ in the Holy Eucharist on Monday’s after getting to discuss Sunday’s Mass. God bless you and keep you in his mighty care! Pray for these rescuers, especially that more will join in their efforts. Their actions remind me of the white rose group in Nazi Germany. 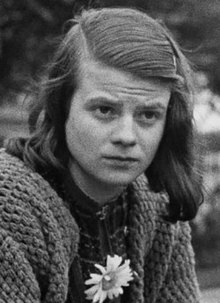 If you haven't seen the film, Sophie Scholl, it's well worth watching. These brave students were committed to peacefully resisting the Nazi juggernaut printing and distributing flyers all over Munich opposing the Nazi regime. They were captured and executed for their courageous non-violent resistance. 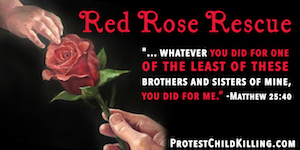 Today's red rose rescuers carry on the legacy of the white rose. 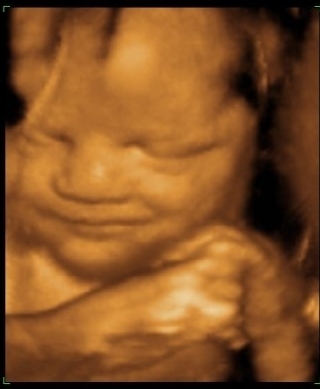 They bear witness to the awful tyranny of abortion and are modern white martyrs against the tyranny of legalized child-murder. They deserve our thanks and our prayers. Most Sacred Heart of Jesus, have mercy on us. 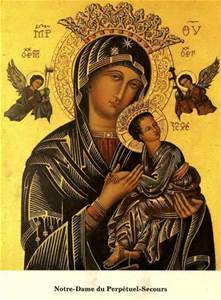 Our Lady of Life, pray for us. Are bullets through the windows next? What The Devil Is It All About Anyhow? You might be a cannibal!